The car itself is extremely innovative, technical, and advanced. In order to properly design the software behind the car and the appropriate measures to take in any given situation, the Google engineers mined data from different cars; in total they monitored over 200,000 miles of driving. After analyzing their findings, the engineers came to the conclusion that people do not, in reality, follow the rules of the road. And thus, Google thought it would be best to have the cars respond to many of the unwritten laws of the road that people are more likely to follow. 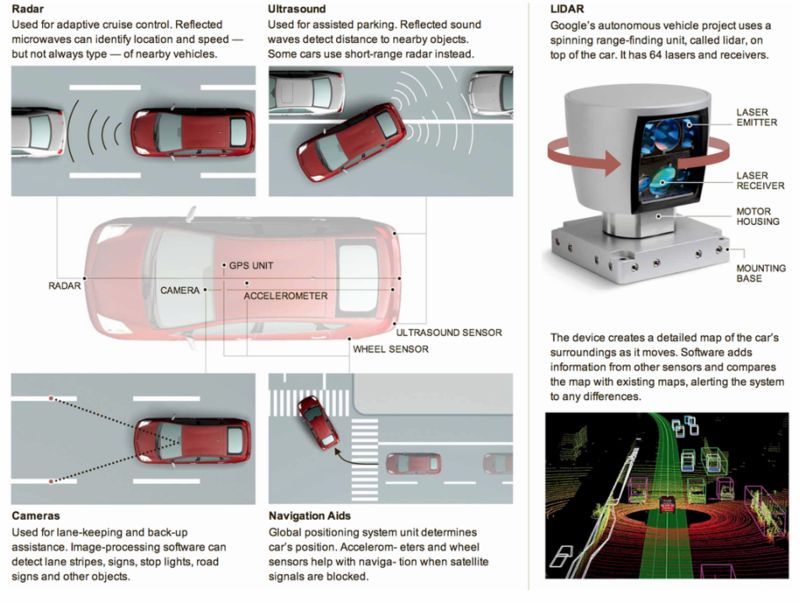 One interesting emerging technology that could be revolutionary in the future of autonomous cars is the concept of vehicular communication systems. This will allow vehicles to be able to communicate with each other and the associated commands will make it possible to dynamically route traffic in ways to optimize traffic patterns by maximizing flow an minimizing travel times. This innovation could completely change the way we look at transportation and even provide predictive measures to traffic. However, don’t expect a mass production autonomous car to come out in the next few years. Google has not announced any plans to make their Driverless Car available for purchase yet. The sensors and chips for this car astronomically expensive. For instance, LIDAR alone costs around $75,000. Prices as to the whole setup cost around $150,000. This is way beyond the price scope of 99% of drivers. However, the costs in the future, once economies of scale kick in, are expected to drop and be able to be scaled down readily.